I don’t mind telling you, I was way out of my comfort zone that weekend in April. Every now and then, I try to do something challenging so I don’t get too comfortable, too complacent, too sure that I have things figured out. And besides that– I love to learn. The occasion was a Natural Lifemanship workshop about trauma-informed equine assisted work. The ‘book learning’ was wonderful, there were online videos to watch pre-workshop, there were discussions of the neurobiology of trauma and connection, but where the real learning happened was in the four pens in the barn. Each of the four pens had one horse, who watched as one at a time the workshop attendees entered this horse space and began asking for the dance of creating relationship. I had chosen this workshop because the principles and model closely align with the way I do equine work, and the challenge for me would be connecting with horses I didn’t know. This meant asking for relationship in a new way. One of the things that was poured into me early about creating relationship as a therapist is I should never ask the women I work with to do what I have not done or am not willing to do. Therefore, I know how hard it is to drop defenses, to let go of the old thought patterns, and to do the work to engage new ways of being. In the six years I have been doing this equine work with women, I also know that every time I enter the arena, the round pen, the paddock with the herd, I learn something about how I do relationship. Over the years in the lessons from the horses, I have learned that my tendency to be direct leaves little room for the other in the relationship to make choices. I have learned what situations or body language make me feel vulnerable and understand what my options are when I feel that way. I’ve learned the concept of living separate but connected, having needs and asking for those to be met is not a sign of weakness, and, how to be strong without being overbearing. The horses have allowed me to understand how imperfect I am and to be okay with it. They have gently, for the most part, shown me when I need boundaries or when I have pushed, asked too much, or crossed their boundaries. Through the work with the horses, I have learned how to slow down enough to ask for what I need and for others to get what they need. A horse doesn’t get my nervousness about whether or not he will like me. He responds to how I try to make connection with him, not on my need to connect. His senses are attuned to what I am saying with my body language and my intention within his space. My words don’t affect him unless the tone or the volume indicate the energy in the environment may have changed. If my words and my actions match, I have a much better prospect at establishing a relationship than if my words and my body language are incongruent. And yes– this is true not only of my four-legged relationships but applies to of all my two-legged ones. Back to the challenge of working with horses that I did not know. Walking into the arena was somewhat akin to me going into a room of strangers, visiting each table and asking one person at each table to enter into relationship with me. Not only that, but asking them to trust me to be honest and open with them, and to have open, yet secure boundaries within myself. And finally, after I made the connection, I was then going to ask them to stay connected even when I moved on to the next table. Cue –extreme discomfort for an introverted soul. On the first day of the workshop, I chose to work with an older guy whose shaggy coat was appropriate for the freezing April we’ve experienced. His head was low and his eyes tired but alert to the 20 or so people milling about in the barn. His tongue hung out between his lips just a bit and he had the look of an old gentleman that had seen too much about the world. I realized that I was drawn to him because he felt familiar and safe, it was a good place to begin. Often, my first heart’s desire is to walk up, pet whomever, rub on their neck, tell them in so many words (or in this case actions) that I am a safe person. But I have learned that that is not the best way to start a relationship with anyone, including a horse. It is a much slower process that involves subtle and intentional connection and trust. That familiar old way of thinking that I had thought was dealt with showed itself. It didn’t take me long to realize that I was working from my head and not from a place where mind and body where open to communicating my intention clearly. At that point I had an ah-ha moment that felt like yuck—“Is this how I do relationships?” but the ah-ha also felt like ‘Oh yes, I get it’, then freedom, enlightenment! When I first talk to the women I work with about lessons we can learn from horses, they often start with some level of doubt that an encounter with a horse will help them understand more about who they are. We talk about being willing to show up and trust the process, and allowing themselves to be vulnerable, curious, and open. Then, as they begin to do the work to create relationship and connection with the horse, there are ah-ha moments, a chance to practice new thought patterns, challenge old ways of doing. The lessons become about empowerment, awareness, and change. What about you? Are you ready to learn about how to do life with a new richness, more self-compassion, more trust, stretch yourself and discover how to live out your values? To tolerate the discomfort and the fear in order to be more fully engaged with your day-to-day and your relationships? To practice grace and start living like you are enough? To allow yourself to be imperfect and to possibly fail in order to learn more about being resilient? And finally, to taking chances with uncertainty and the unknown and practice courage and whole hearted living? We can spend a lot of time talking about how we want change, how we want to live with passion, purpose, and intention. But just like the workshop I attended, I learned a lot about the ideas, the principles, the intention of the model, but it wasn’t until I actually entered the arena and put the knowledge into action that the concept and my entire system (physical, emotional, cognitive, sensory, and yes, spiritual) expanded to make the new stuff part of my personal vocabulary. What can you learn and what are the lessons from the horses… it’s the chance to take the head stuff and move it into something that sticks, that makes sense, and is useful to your life. 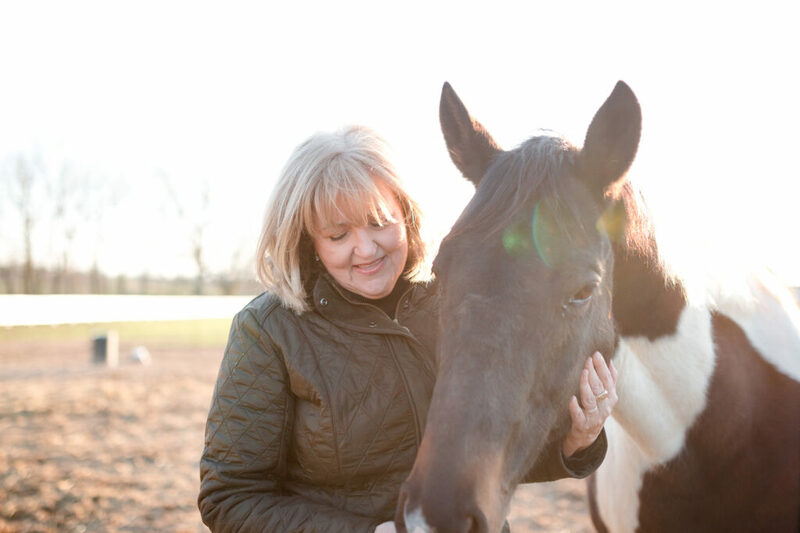 If you are ready to step out of your comfort zone to have this experience for yourself and are ready for an encounter with like-minded women and a herd of wonderful horses– then The Authentic Self Retreat in Lexington, KY, October 5 & 6 is your opportunity for an unique ‘arena’ experience. This two-day retreat is based on the powerful concepts of Brenè Brown’s Daring Way™ and the experience of relational equine assisted learning. The work with the horses is all non-mounted and you need no horse experience. The first day will consist of exploring trust, relationship with self, and identifying your values to rediscover your creative and resilient self. The second day will focus on deepening your skills of self-compassion, authenticity, vulnerability, and creating a plan of action for moving toward the life you want to live. We want you to leave this experience with a clearer sense of who you are and how you want to show up in your day-to-day. The horses will help you understand more about how you can ask for what you need and how to communicate from a place of intention and purpose that is empowering and freeing. Join myself, Laura Reagan, LCSW-C, the herd, and equine professional Lisa Swanson for a truly unique and empowering experience.